So, the time of year has come when mage’s robes are the most cumbersome, and days go by where I can’t seem to cool off, no matter how many walls of ice I cast. Running the oven would only make things worse, and a hot, heavy meal is the last thing I want! After a day of trying to keep my water elemental from becoming a steam elemental, I usually wind up eating something light and easy for dinner. Still, I like to keep room in my schedule for experimentation, and that time seems to come on weekends. After a trip to the farmer’s market and some quality time conjuring ice wraiths, I can dust off my cooking scrolls and try something a bit more adventurous! 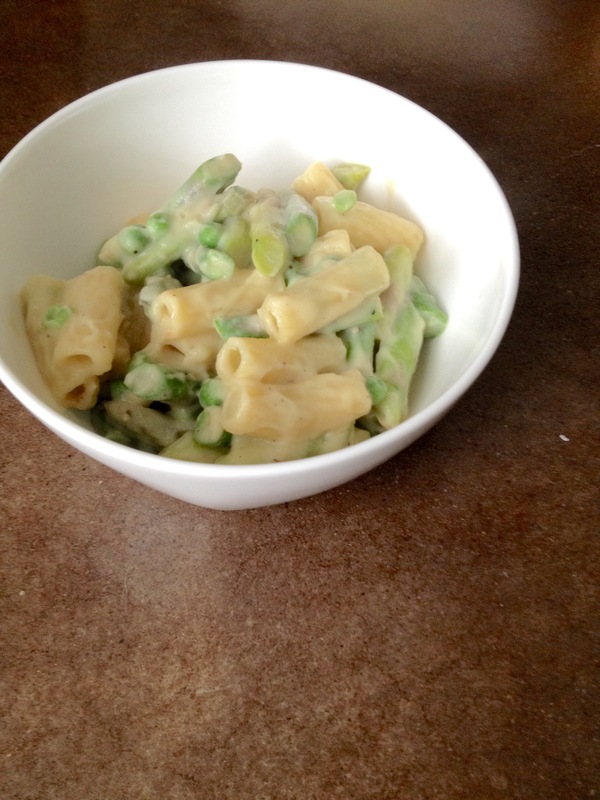 Finding myself with access to crisp green beans, fresh asparagus, and cheap cauliflower, I whipped up a “cream” sauce with cauliflower to make an alfredo/primavera sauce! I start the water boiling for pasta, then toss the cauliflower in my microwave steamer for a few minutes. Once the water boils, the cauliflower is usually ready for the blender. After the pasta is done and drained, I immediately add the sauce and veggies in to let it integrate. Depending on your setup, the timing might be different. This is a super easy recipe that comes together in about 30 minutes- and is a perfect way to put great produce on display! In addition to making a great dinner (and really impressive plant magic sleight-of-hand!) this dish also keeps well as leftovers, and has a passive +5 to jealousy for any who smell it! * or just use one pound of either! Begin preparing pasta as according to box instructions- time this so that your sauce (which takes about 10 minutes all told) is ready before your pasta is, so the pasta and sauce can be added back to the pot after draining! Steam cauliflower until completely tender. For me this took 3-4 minutes in a microwave steamer. Your times may vary! If you would rather boil the cauliflower, keep the water hot for the asparagus, beans and peas! Add nutritional yeast, garlic, lemon juice, salt, pepper, cauliflower and ¼ cup non-dairy milk to blender- I add the nutritional yeast first so that it’s not on top when I start the blender- it reduces how much I have to scrape the sides of the blender! Blend starting on a lower speed until cauliflower is mostly blended, using a tamper if your blender has one. As it integrates, increase speed to high. Add more liquid as necessary to keep the sauce moving or to get to desired consistency. Let the blender run for a minute or two to really make sure the sauce is smooth! Steam asparagus, green beans, and peas in the microwave for 3-4 minutes, or boil/saute as desired! Drain pasta, add sauce and veggies, stir to combine and serve hot! This entry was posted in Magic Upgrade, powerful & potent, quick dinner and tagged dessert, dinner, DIY, great leftovers, healthy, homemade. Bookmark the permalink.